With the Admin-Only toggle on, only users logged in to the mobile app as an admin can post content to to this page. The functionality is the same as normal with these pages — images and text can be posted from a mobile device — except that all users but administrators are disallowed from posting. You will find this setting on the left side of the editor when a News Feed or Crowd Pics page is active, under the page settings toggle. 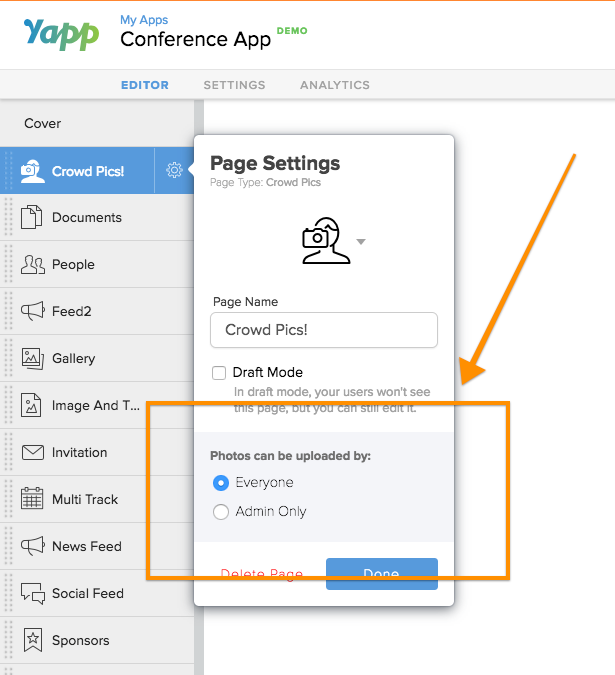 Make sure you select “Admins Only” to stop others from posting in the News Feed or Crowd Pics page. * Admins include the app creator as well as any Team Members (see Getting Started with Teams for more info).